One night only! Laser light show, dance and valentine party. 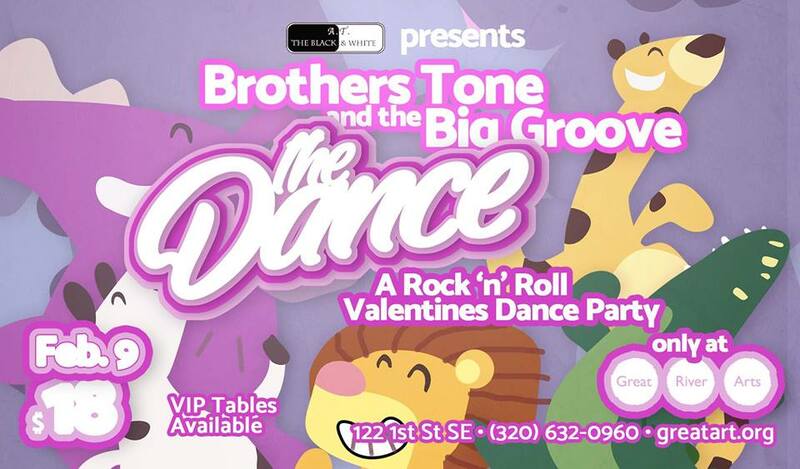 areas most exciting and entertaining R & B band, Brothers Tone & The Big Groove. This 11 piece rock band is complete with female backup singers and a horn section. This exciting band will entertain you with covers from artists including: Chicago, Aretha Franklin, Eagles, Keith Urban, Garth Brooks, Linda Ronstadt, Bon Jovi, Eric Clapton, The Monkees, Neil Diamond, Santana, Justin Timberlake, Bruno Mars, K.C. & Sunshine Band, Journey, Head East, Lady Antebellum and more. Tickets are available at GRA, Reality Roasters and on line at GRA website. Tickets for show only, $18 Saturday, February 9, one night only! VIP tables can be reserved through GRA for groups. Doors open at 6:30 for social hour with show at 7:30 Get your tickets early is seating is limited and has sold out in previous years.